Limousine liberal Leonardo DiCaprio — you know, the talented actor who flies around the world in a private jet telling people they should make sacrifices to combat climate change — is hosting a fundraiser for Hillary later this month. Tickets cost $33,400 each. Leo used to support Bernie but happily switched to Hillary once she became the nominee. 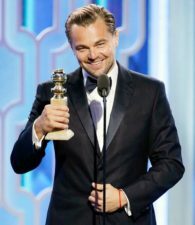 Does Leo Really Want An Oscar?